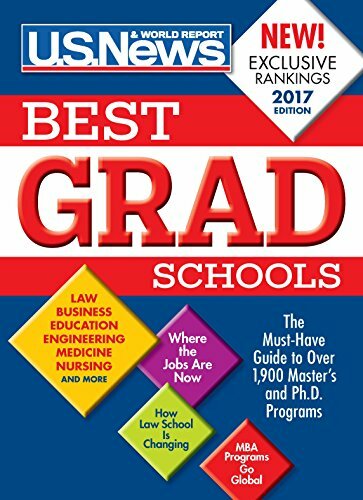 Whether you are considering an MBA, a law degree, a master s, or a Ph.D., this must-have guide to more than 1,900 U.S. graduate programs can help you find the best one for you and the money to pay the bills. Explore U.S. News & World Report s latest exclusive rankings of programs in business, law, engineering, education, medicine and nursing, based on an exhaustive analysis of such factors as the competitiveness of the student body, faculty quality, depth of research, and expert opinions about program excellence. Also featured: top choices in the sciences, social sciences and humanities, the allied health professions, fine arts, and public affairs. Plus you ll find the best online master s programs in business, computer information technology, criminal justice, education, engineering, and nursing. In addition, a comprehensive 160-page directory of business, education, engineering, law, medical and nursing schools provides such vital information as admissions and financial aid contacts, application deadlines, cost of attendance, acceptance rates and more. “Should You Go to Grad School?”: The U.S. is becoming more of a graduate school economy, but the ROI varies widely from one field of study to another. “B-School Goes Global”: MBA programs are adding new paths for students to gain international exposure. “Seven Great Paths Beyond Teaching”: A master’s in education can open up opportunities beyond the classroom. For more than 30 years, U.S. News Best publications have been the definitive consumer guides to higher education in the United States. As The Washington Post noted, You can’t pass up the granddaddy of college rankings. Note: Advertisements from universities and other reputable organizations enable us to offer this valuable guidebook at an affordable price. Advertisements do not influence current or future rankings.